I hate plastic bags. I really do. I hate the smell of them, how hard they are to open up the first time you use them, how easily they rip. I hate knowing what they’re made of and how long it takes for them to decompose. I hate how quickly they accumulate and I hate stories of sea creatures and birds eating them. Have you seen this video showing a seagull swallowing a plastic bag over 5 minutes that never seem to end? You should. It’s pretty horrifying. I started making reusable produce bags years ago (you can see my first ones here) and I love them! Not only do they help me avoid using plastic bags for my fruits and veggies, I can also store my produce in the fridge inside the bags, because the fabric allows them to breathe. Over time, I’ve given them away as gifts and tried out different fabrics and sewing methods. 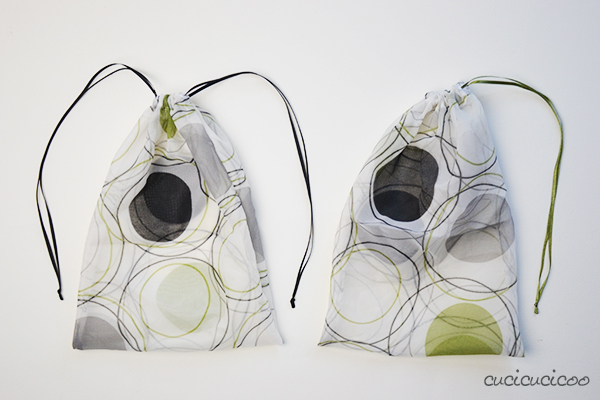 And today, as the tutorial going along with the buttonhole lesson in my Learn to Machine Sew course for beginners, I’ll teach you how to make two types of reusable produce bags with drawstring closures! But even if you’re not interested in making produce bags, I still suggest you try out this technique, because it’s always useful to know how to make a drawstring bag! 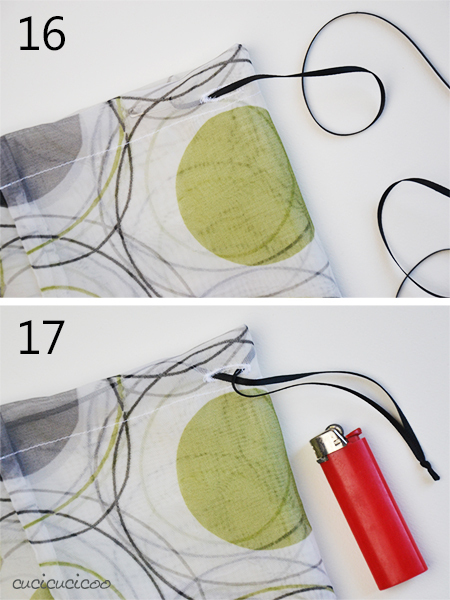 And just to prove it, I’ll show you at the end of this post how to make some other cool drawstring bags for other uses using the same slightly modified techniques! 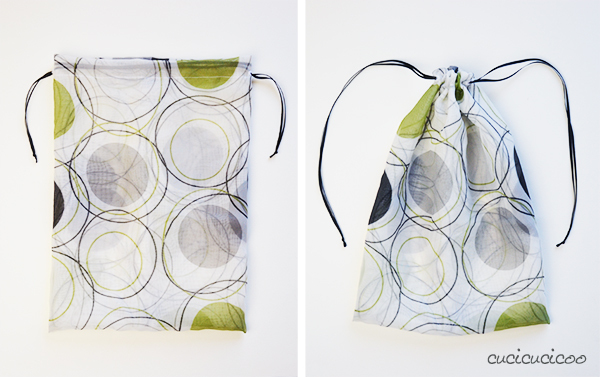 There are lots of ways to make drawstring bags, and these are only two of them. Because chiffon-like fabrics fray like crazy, I’ve designed these bags to have all edges enclosed inside the casing or french seams. Don’t worry, it’s actually really easy! Let’s get started! First: fabric. You can make a drawstring bag out of pretty much any light-medium weight fabric, however you want produce bags to be as light as possible, because the contents will be weighed inside the bag, and why would you want to pay extra to cover the weight of your own bag? 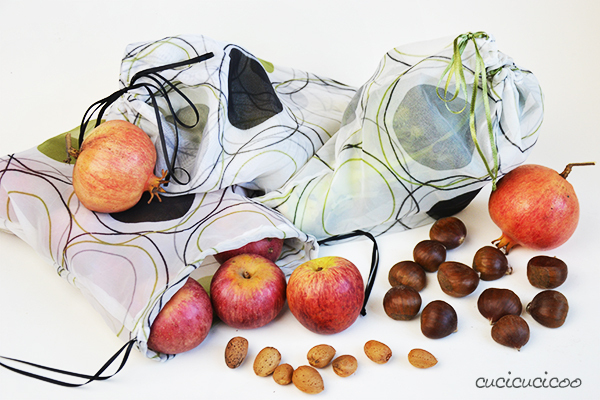 So, although I usually spurn synthetic fabrics, I generally use very lightweight mesh or chiffon for produce bags. How do I keep my ecological mind happy? I’ve discovered that at my local outdoor markets, there is an abundance of used sheer curtains for sale for very cheap. I have a huge stash of them which I’ll probably never use up, because just one curtain is enough to make roughly 10 produce bags, depending on the size and style you make them. Incidentally, you can also use them instead of tulle for making cute no-sew tutus, FYI. 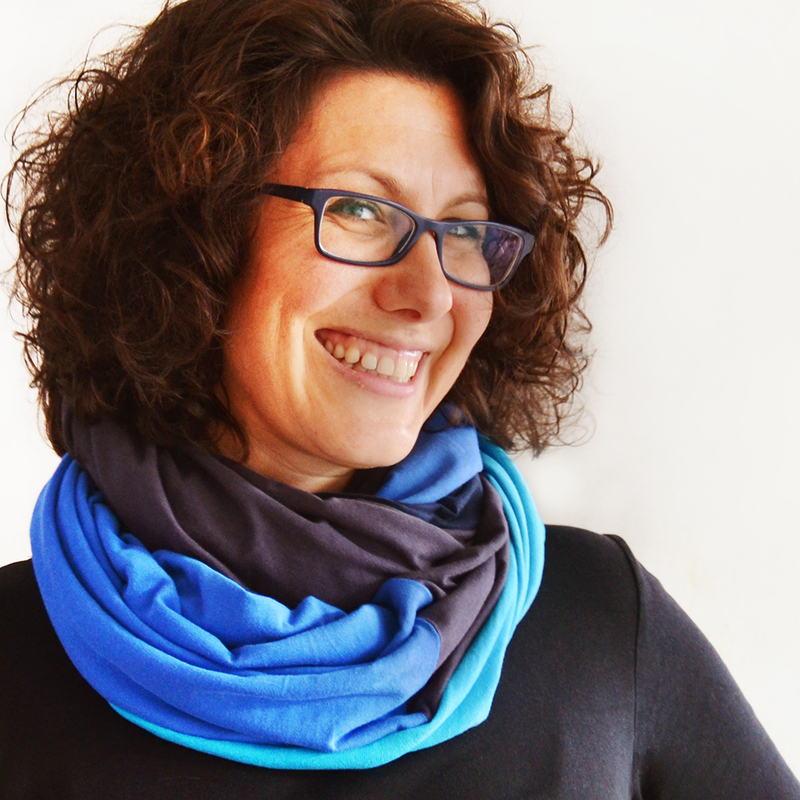 So much cheaper and eco-friendly than buying new fabric yardage! You can also make these bags from very lightweight woven cotton fabric if you plan on buying things like bulk flour in them. I’ll be showing you how to make both a single-layer produce bag and a double-layer one. I generally prefer single layer ones because they use less fabric, but the double layer ones are sturdier. 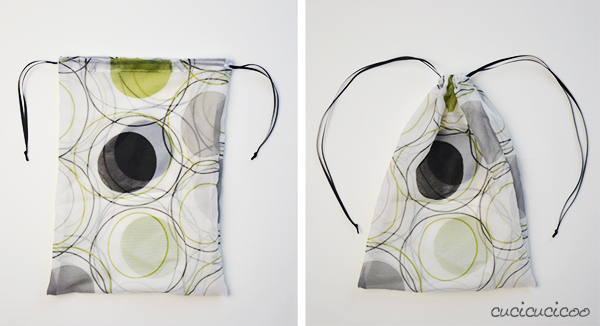 These are size small bags, but remember that you can make these any size you want. I suggest making large produce bags with the double-layer method so as to better hold the weight. 1. 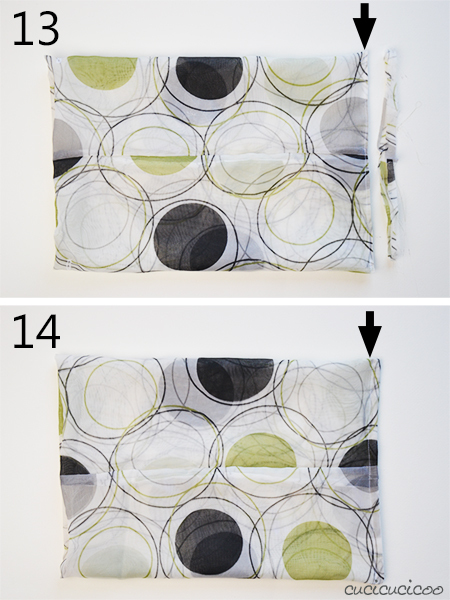 Fold the fabric rectangle 64 x 74 cm (25 x 30″) in half the long way with wrong sides facing. 2. 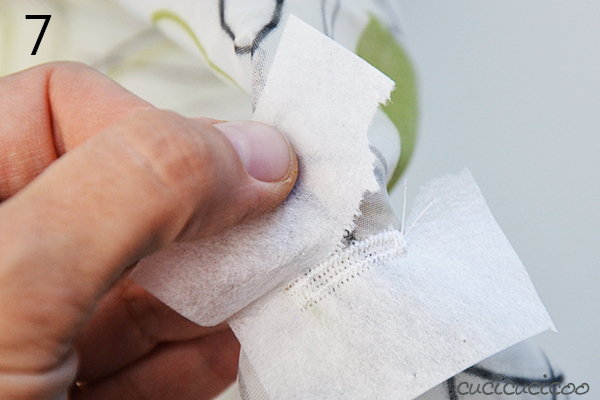 Fold the fabric in half again the other way so that you end up with a shorter rectangle. 3. 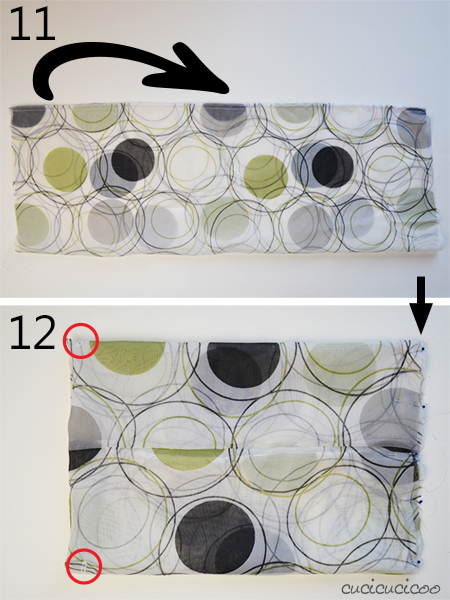 Stick a pin in the top layer of fabric 1 cm from the fold from step 2, halfway across the folded fabric. 4. Unfold the fabric where it was folded in step 2. 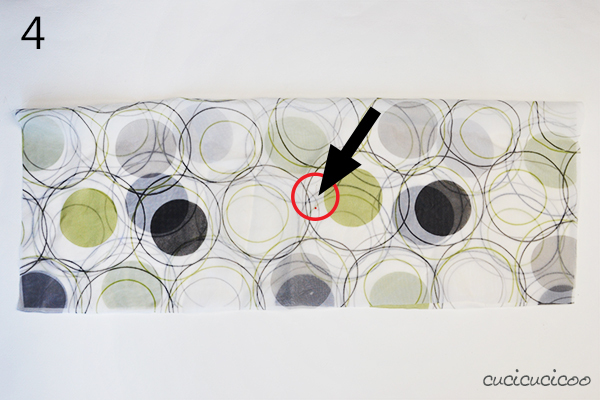 Stick a second pin in the top layer right above the first pin (which you can see through the sheer fabric). 5. Cut two squares about 5 x 5 cm (2 x 2″) each from the tear-away stabilizer. Stick one underneath each pin with another two pins to the sides. In the top picture above, the original pin is the red one, while the blue pins are the ones holding the stabilizer in place. You can just barely see the stabilizer beneath. 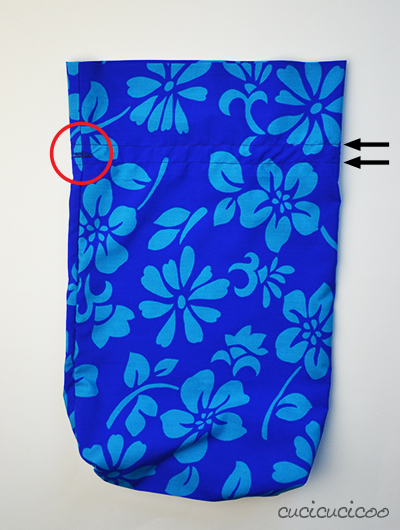 The picture below shows how the stabilizer is held in place on the back of the fabric. 6. 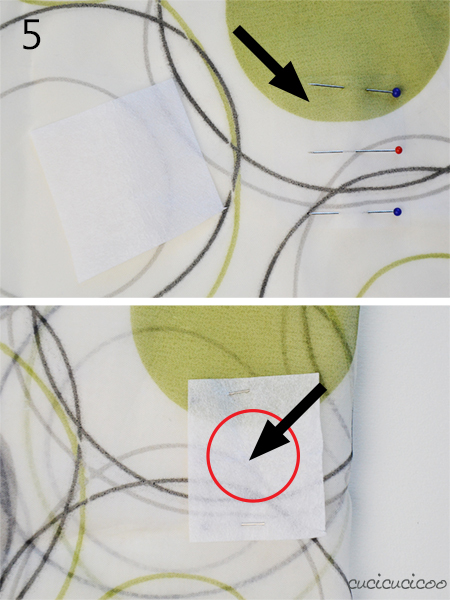 Sew a buttonhole about 1.5 cm (1/2″) long on the right side of the fabric (so that the stabilizer is underneath) in the point marked by the center pin. Repeat for the second set of pins/stabilizer. 7. Gently tear away the stabilizer. The stabilizer will remain in place under the stitching and in the center of the buttonhole. This adds stability to the buttonhole, which is what we need when sewing on chiffon or other very lightweight fabric. 8. 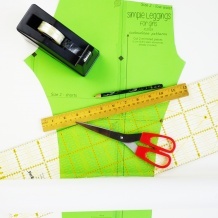 Cut open the buttonholes with a seam ripper or embroidery scissors. 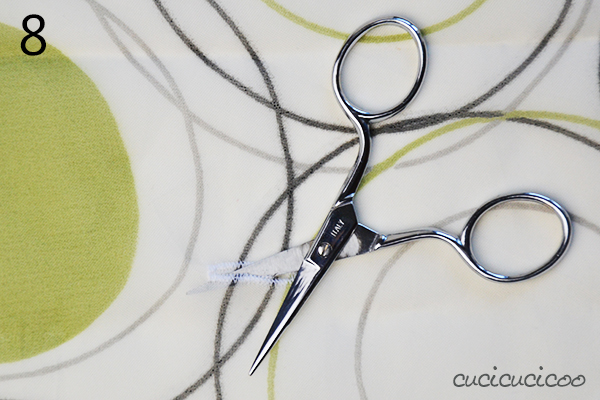 I prefer using scissors with lightweight fabric to avoid pulling the threads of the fabric. If you want, you can apply Fray Check to the inside of the buttonholes to avoid any threads from coming loose. Now let’s do some French seams! 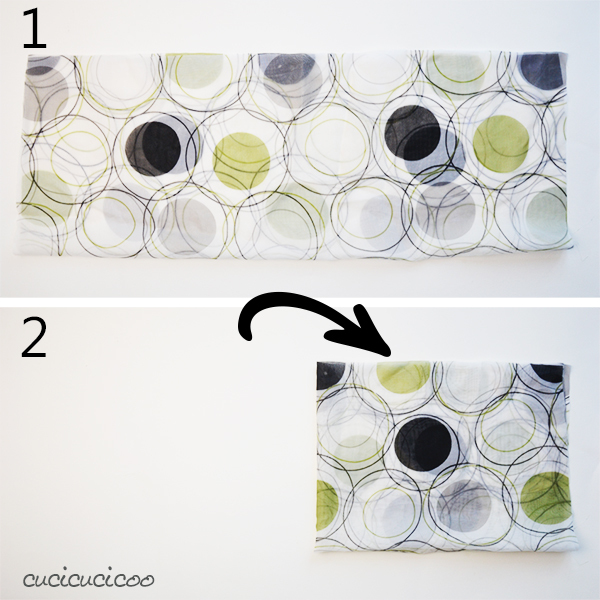 They’re really easy, hide fabric edges and add lots of stability to your sewn item. 9. Fold the rectangle in half lengthwise, to create a long rectangle. Make sure that the wrong sides are facing and the right sides of the buttonholes are facing outward. Pin the edges. 10. Sew along the pinned edge with a straight stitch with a 1 cm (3/8″) seam allowance, then trim the fabric edge very close to the stitching, about 2-3 mm away. 11. 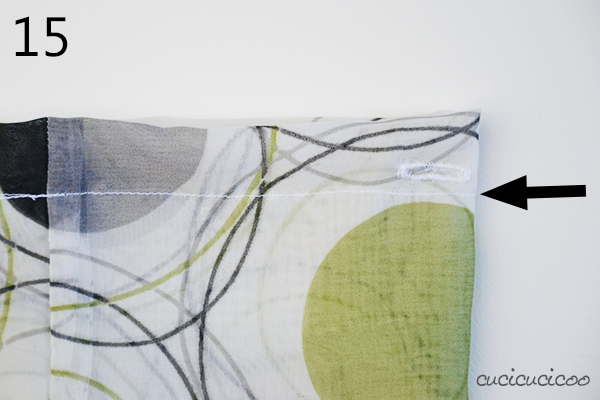 Turn the tube inside out and flatten it with the seam at one side. 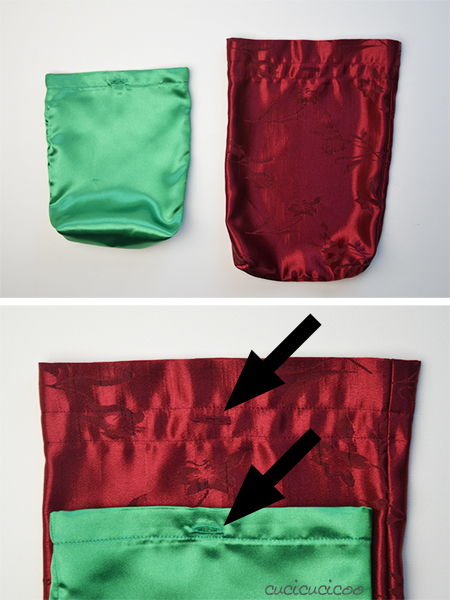 Iron or finger press the seam flat, then sew down that same side with a 1 cm (3/8″) seam allowance. In doing this, you’ve enclosed the raw edges between the two lines of stitching. And that is a French seam! Now start turning the bag right side out from one side, but stop when the two ends of the tube meet. You now have a shorter tube with two layers. 12. 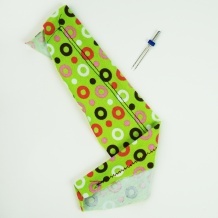 Rotate the tube around so that the side seam is now centered and the two buttonholes are at the folded sides. 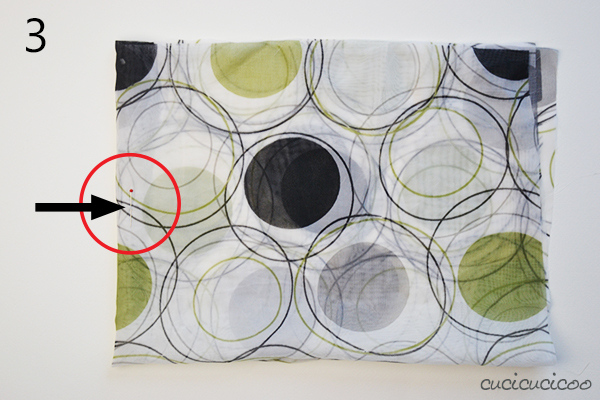 Make sure that the right side of the fabric is facing out! Pin the four layers of raw edges together (indicated by the arrow). Time for another French seam on the bag’s bottom. 13. 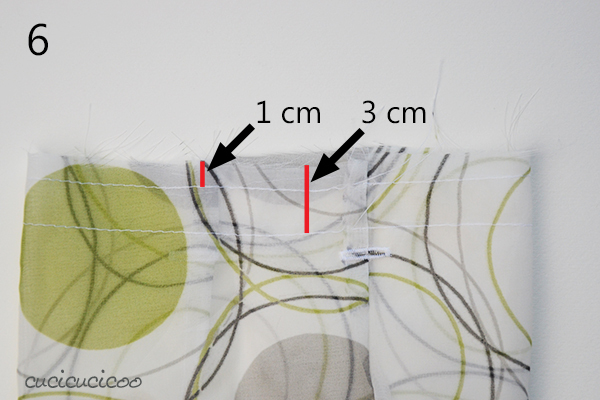 Sew down the pinned edge with a 1 cm (3/8″) seam allowance, then trim the fabric close to the seam (2-3 mm away). 14. 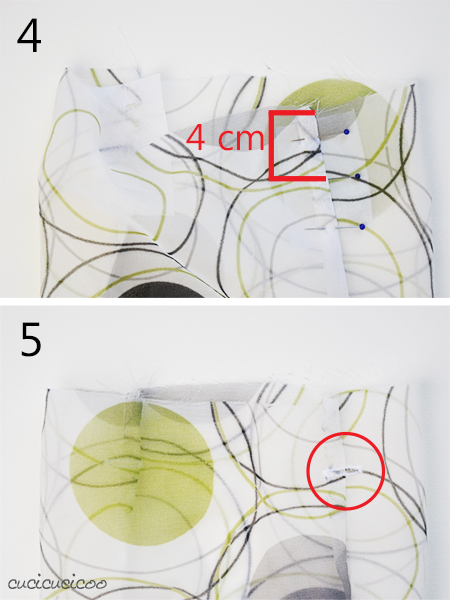 Turn the bag inside out, flatten or iron the edge sewn in step 13, and sew down it again with a 1 cm (3/8″) seam allowance. 15. 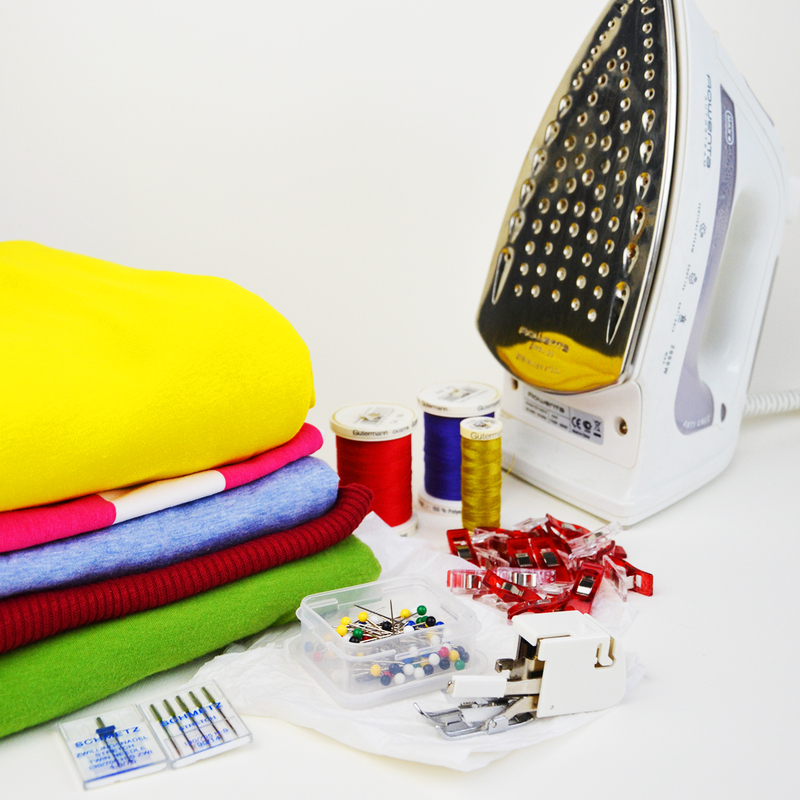 Slip the opening of the bag over the free arm of your sewing machine (not sure what a free arm is? Look here.) and sew all around the opening with a 2 cm (3/4″) seam allowance. Remember to backstitch at the end. You’ve now created an instant casing! 16. 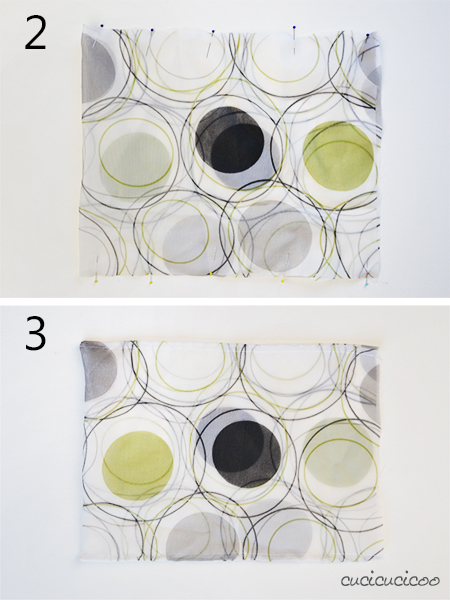 Cut your ribbon or cording into two 80 cm (31″) pieces. Stick a safety pin into the end of one piece of ribbon and slip the safety pin through one buttonhole, inside the casing. 17. Scrunch the safety pin all the way around the casing and back out the same buttonhole, like we did with the elastic in the waistband casing lesson. Knot the two ribbon ends together and trim the ends beyond the knot. If using a synthetic ribbon or cord, hold the trimmed ends over a flame to slightly melt them, thereby avoiding any fraying. Use the safety pin to insert the other piece of ribbon into and out of the second buttonhole and knot the ends. And you’re done! Put your fruit and veggies inside the bag and pull the two cords to close up the top! 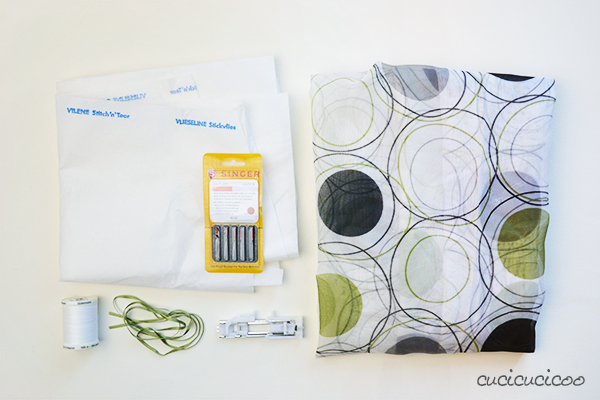 If you want to make the most of your fabric, or make the absolutely lightest bag possible, try the single-layer bag! 1. Lay out your 34 x 66 cm (14 x 26″) rectangle, wrong side up. 2. Bring one short end over to the other side so that both short ends are lined up with the right side of the fabric facing out. Pin the two long sides together. 4. Turn the bag right side out. 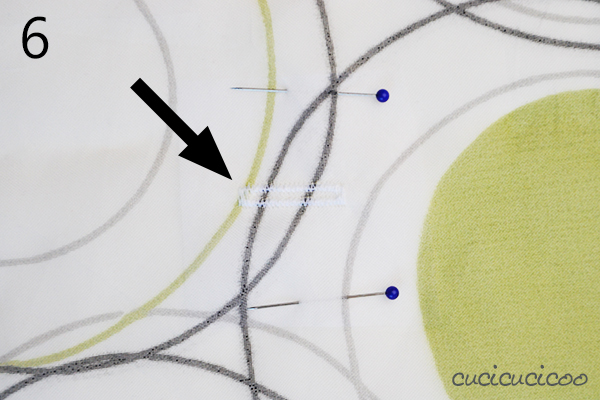 Place a pin along each side seam 4 cm (1.5″) down from the top unsewn edge (the black pin in the picture). Then cut two squares about 5 x 5 cm (2 x 2″) each from the tear-away stabilizer. Stick one underneath each pin with another two pins to the sides (the blue pins in the picture). 5. Sew a buttonhole about 1.5 cm (1/2″) long on the right side of the fabric (so that the French seam and the stabilizer are underneath) in the point marked by the center pin. (Use the machine’s free arm to maneuver more easily.) Repeat for the second set of pins/stabilizer. Tear off the stabilizer and cut open the buttonholes (as shown in steps 6-8 of the double-layer bag). 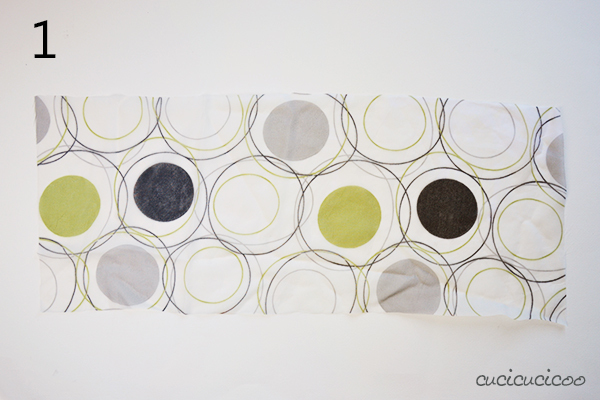 Now it’s time to sew a casing, however it’s hard to fold and iron the fabric edges of this synthetic sheer fabric, so I’m going to show you a little no-ironing trick to sew a casing! 6. Sew two lines of basting around the opening, the first 1 cm (3/8″) and the second 3 cm (1 1/4″) from the raw edges. 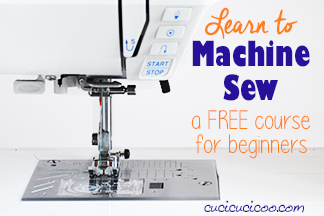 Use the longest stitch on your machine and sew around the opening using the machine’s free arm. Do NOT backstitch at the beginning or end. 7. Turn the bag wrong side out. Starting at one side seam, fold the fabric over at the top line of basting. 8. Fold the fabric again at the second line of basting and pin in place. 9. Repeat steps 7-8 at the other side seam and at least at the two points between them, so that you have at least four pins in place. Don’t worry if the folds don’t stay flattened. 10. 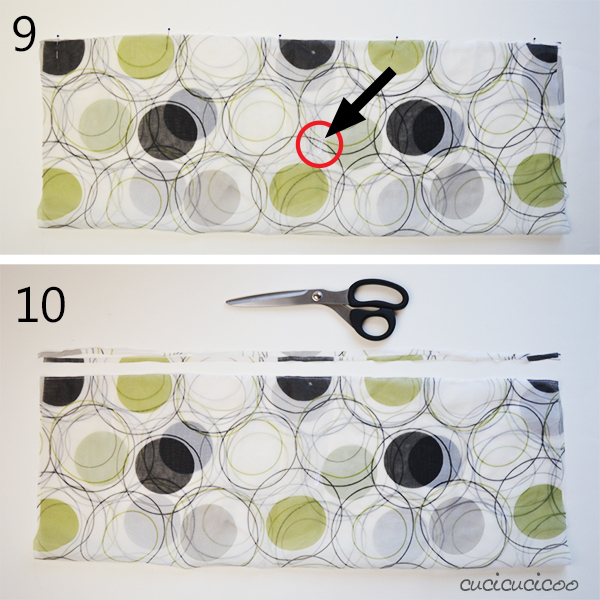 Use the machine’s free arm to sew around the entire opening about 2 mm from the fold from step 7. I do this by lining the fold up with the left edge of the presser foot and moving the needle all the way over to the left. 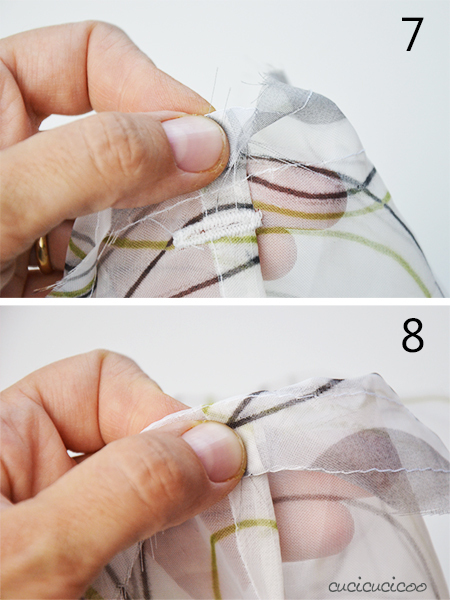 Make sure to fold the fabric along the two sets of basting stitches as you go. Also remember to use a regular stitch length and to backstitch. Pull out the basting stitches with a seam ripper (or leave them if they don’t bother you) and insert the two drawstrings as explained in steps 16-17 of the double-layer bag instructions. And there you have your super lightweight produce bag! Just pull the two strings to cinch the opening closed! This type of drawstring casing sewn with buttonholes is actually a departure from the classic drawstring bag opening, but it’s a perfectly valid version. You can make all sorts of other easy variations, too. 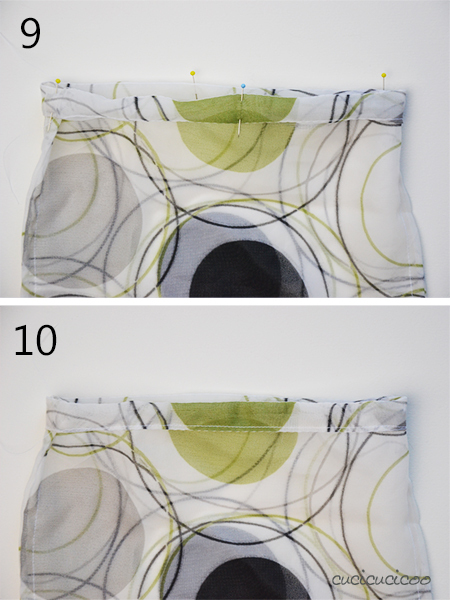 For example, you can sew only one buttonhole for a bag with just one drawstring. It does save time, however with just one string, the bag opening gets distorted when closed, as you can see above, and it also opens up a bit on its own, while a bag with two drawstrings stays closed much better. 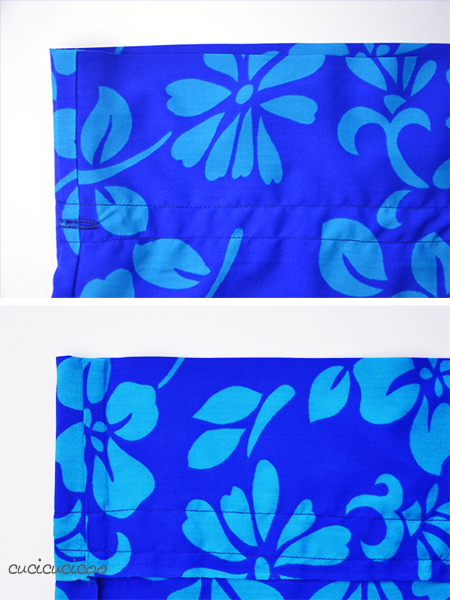 I used a 31 x 112 cm (12 x 44″) piece of Hawaiian fabric (which you may remember from my furoshiki Japanese gift wrapping tutorial) and sewed it as a single-layer bag. 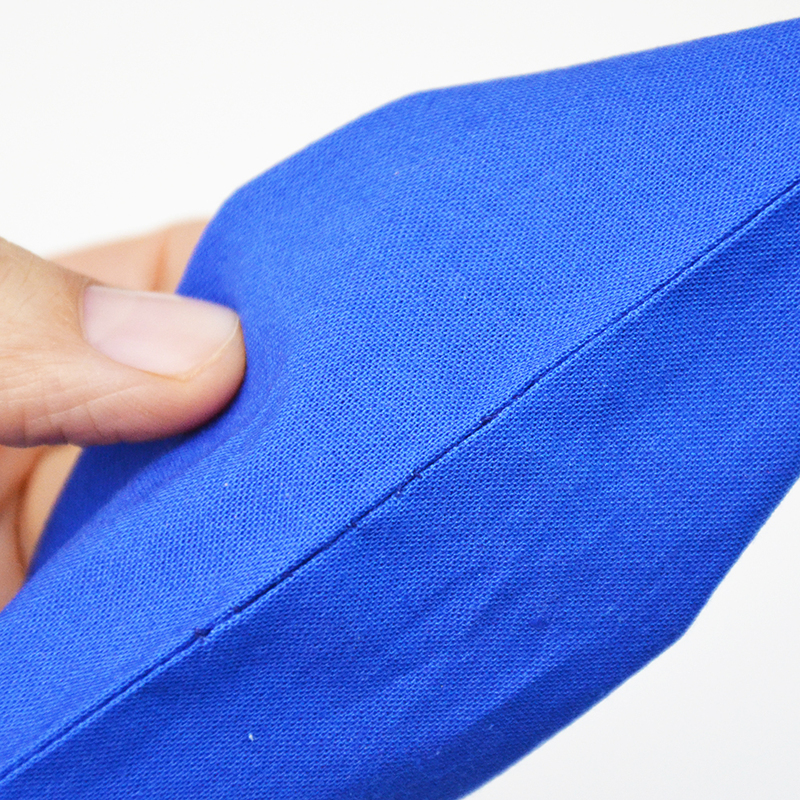 When it came to sewing the casing, I folded the top edge down by 11 cm (4 3/8″), then sewed around the opening twice, 1 cm (3/8″) and 3 cm (1 3/8″) from the inner fabric edge. I didn’t bother folding under the fabric edge before sewing the casing because that edge happened to be the fabric selvage, which doesn’t fray. And this is what it looks like. I also sewed boxed corners to create a nicer shape and fit items inside bettern. Just insert the drawstrings, and you’re in business! 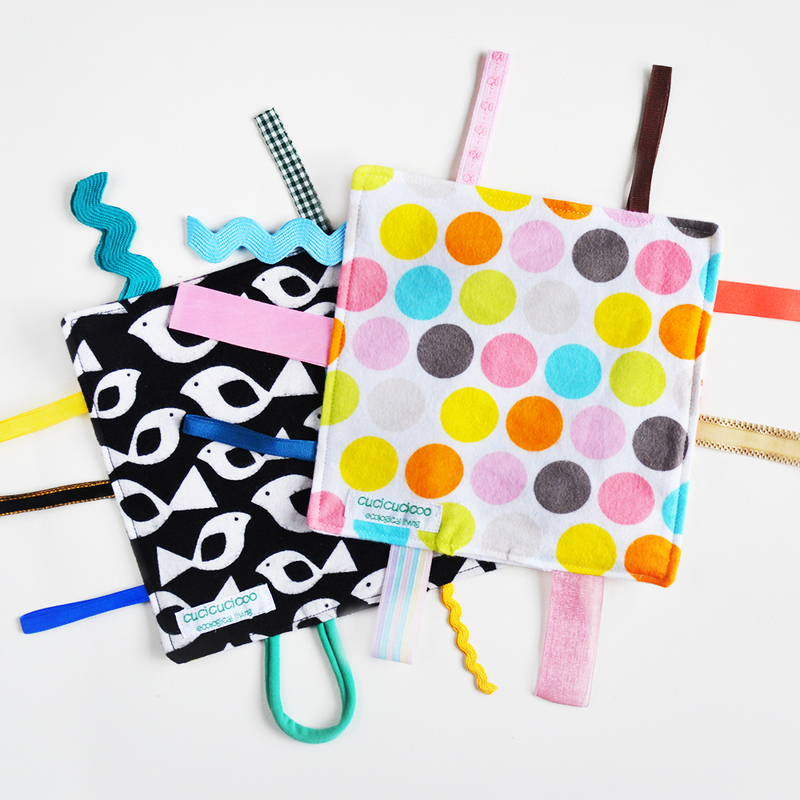 Or why not sew some fancy reusable gift bags with this technique? 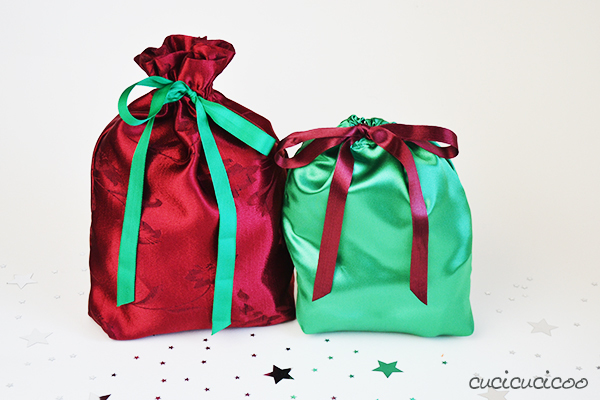 Anyone would be happy to receive a gift in these lovely satin bags! 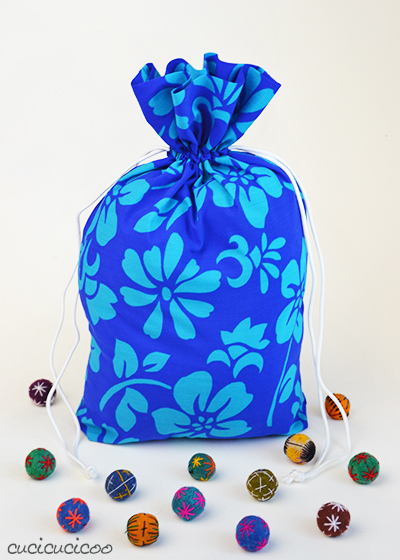 Once you get thinking, you can find a million uses for drawstring bags! 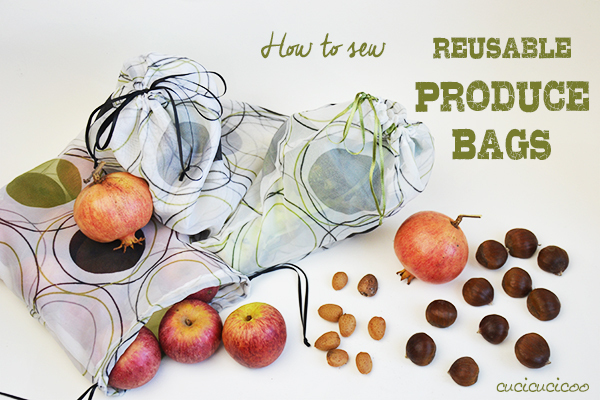 For example, why not sew a small bag to stuff your empty produce bags into when you go to the supermarket? So many possibilities! How would you use a drawstring bag like these? 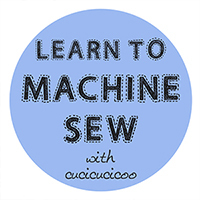 This tutorial on how to sew reusable produce bags and other drawstring bags is part of the syllabus of Cucicucicoo’s beginner’s sewing course! Don’t forget to share pictures of your bags on the Cucicucicoo Creations Flickr Group or the Cucicucicoo Facebook page! bisogna dirlo : nessun blog di cucito ti sta a pari ! Sia per le spiegazioni che per le foto. Reflex ? Marito fotografo ? Che belli i sacchetti di stoffa, li adoro!! Per la frutta e la verdura non li avevo mai fatti ma provvederò…penso che riciclerò delle tende che non uso, grazie per l’idea.. 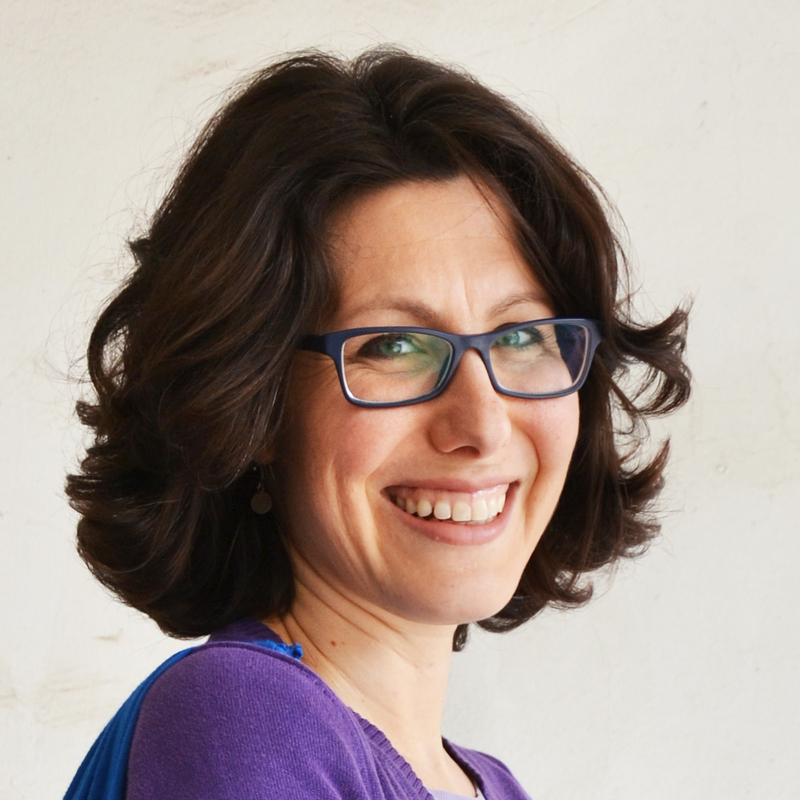 Per i regali faccio sempre sacchetti di stoffa decorati e anche di carta da pacco cuciti a macchina, sono molto carini …Un caro saluto e complimenti per il tuo blog! Ciao, Carmen! Da quanto tempo! Anche a me piace molto cucire sulla carta, e a volte cucio anche delle buste per spedire dei biglietti di auguri o dei pacchetti, sempre dalla carta da pacco, come fai tu. Un abbraccio! I have been incorporating gift bags when I make what I fondly refer to as “Picnic Blankets” I make these for gifts for young children or for baby showers, I use some of the left over fabric and make coordinating bags to hold my gift or gifts, when my daughter had her shower she received three of these bags from me filled with some things that I made for the new baby. So much fun and so easy! That’s a great idea, Rebecca! I also like to make little gift bags with coordinating fabric. Presentation is so important, and this way the recipient gets a great first impression, plus a useful bag! I prefer not to use plastic bags too. These produce bags are so nice idea and sewing them is not a big deal. I have a good piece of fabric for this purpose – my old cotton curtains are still waiting their new purpose. Thank you for this great idea! So glad you like this project, Alison! Ma questo è un tutorial fantastico per fare borsette porta-lavoro, a uncinetto intendo! 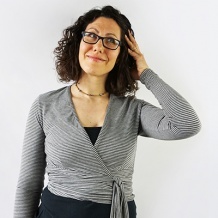 Grazie Lisa, per me è sempre un piacere leggerti! bellissimo sito, mi sta aiutando moltissimo! Io sto imparando a cucire con la mia prima macchina 🙂 questo tutorial è utilissimo, ma volevo sapere se è possibile fare il fondo rettangolare anche nei sacchetti a due strati; grazie! Che bello, Erica! La prima macchina è sempre una bellissima emozione! Ma certo che si può fare il fondo rettangolare anche nei sacchetti a due strati. Basta farlo dopo il passo n°14. Poi se si rifila il tessuto dall’angolo cucito, basta piegare il bordo tagliato su sè stesso e cucirlo per evitare che si sfilacci. Buon cucito! I am going to make these produce bags from your instructions, from a discarded set of sheers. Thank you for providing this. I will make one important change for my bags: no drawstrings. After making a set of drawstring bags for produce a few years ago, I found that I never, ever had reason to pull the bags shut. This is possibly because I shop for 1 person, and almost never buy enough of anything to fill the bag much more than 1/3-full. Drawstrings will probably be more important when I buy very small things in bulk, like flour, grains, spices. So my old drawstring bags, made from a tighter-weave fabric, will be re-purposed for this new job. Hi Dave, of course if you don’t need a drawstring, there’s no need to put one in. I find that, even if I put one thing in a bag, I need to close it because otherwise everything falls out at some point between then and when I unload my shopping at home! Grazie per l’idea fantastica e ecologica.ho seguito il tuo consiglio ho comprato delle vecchie tende e ne ho confezionati diversi e di differenti misure, così non torno dalla spesa piena di plastica.Ho notato anch’io una certa sorpresa da parte dei contadini dove vado a fare la spesa il sabato , ma c’è chi mi dice : ” signora dovrebbero fare tutti come lei!!”. Un caro saluto e ti seguo sempre. Hello! Can I do this via hand sew? I don’t own a sewing machine, but maybe a blanket stich on the sides would work? Sure, Melissa! 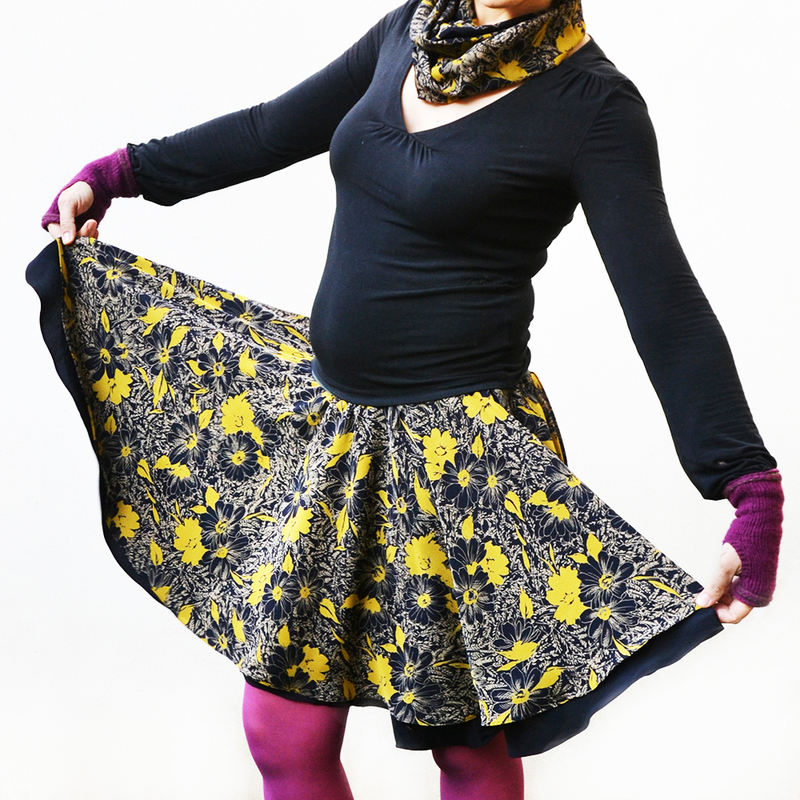 You can hand sew pretty much anything! I don’t know if a blanket stitch would be strong enough to hold the bag together well, especially if you are using this type of sheer fabric which frays a LOT. 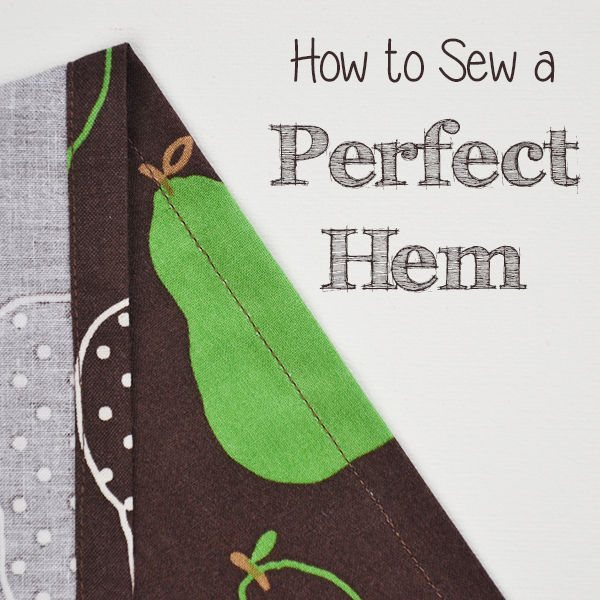 I might just sew wrong sides together with a backstitch, and then kind of roll up the seam allowances and hold them in place with a whipstitch, but I’m sure there are plenty of other ways to do it. Give it a go and see what works best!